BeWell’s Approach to Headaches: What’s causing yours? Home/allergies, Blog, food sensitivities, headaches, PMS/BeWell’s Approach to Headaches: What’s causing yours? Headaches are one common malady with many different causes. They can totally ruin your day and become downright debilitating if they become chronic. There are so many possible causes of headaches, and although Advil or Tylenol will often knock one out, they don’t really get to the underlying cause and, over time, do have adverse effects. 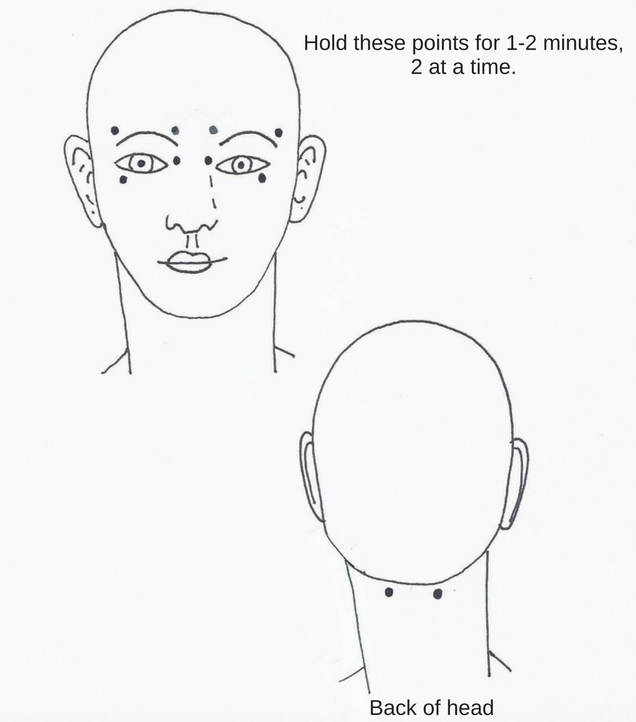 PHOTO: Acupressure is an effective way to eliminate a headache by rubbing specific points on your head. Your fingers will tell you where to go!! Gently massage in a circular motion or simply press on these points for relief. Dehydration: The most common cause of headaches is dehydration. These headaches usually occur later in the day, in the afternoon or early evening. The solution is simple: make sure you’re getting enough fluids throughout the day, especially in fall and winter when indoor heat dries us out. A good rule of thumb is to drink about half your body weight in pounds as the number of ounces of fluids each day. For example, if you weigh 140 pounds aim for 70 ounces of fluids each day. Most of the 70 ounces should be pure water but herbal teas, soup, smoothies and diluted juices would also count. At the first sign of a headache, drink a full glass of water, wait 20 minutes and see if you get relief. If your headache doesn’t subside go onto the next step. Low blood sugar: The next most common cause of headaches is low blood sugar. So ask yourself, when was the last time you ate? And did you have too much sugar and too little protein when you did? Low blood sugar is an often overlooked cause of headaches. SO, after you have a big glass of water, eat some protein, a full meal or at least a snack such as beef jerky or peanut butter on a rice cake, and see if the headache resolves. Sinus Congestion: Sinus congestion can also be the culprit, especially in the spring and fall. We recommend a combination of strategies, such as decreasing your intake of mucus-producing foods, like wheat, dairy, peanuts and high fat foods, and adding an herbal decongestant that won’t make you groggy. These include the powerful anti-oxidant, NAC, which thins mucous and a product called Sinupret. Hidden food allergies: You wouldn’t know about these except through functional testing for IGG antibodies since these headaches can occur up to 48 hours after you’ve eaten the offending food, making them difficult to track. BeWell Associates offers delayed food allergy testing. Chronic muscle tension: You can try a calcium magnesium supplement to see if it helps your headache by relaxing tense muscles, and herbs such as valerian and passionflower that have a soothing effect on the mind. There are many different herbal/vitamin combinations that calm the catecholamines, which are stress hormones that make us tense and achy. One product we especially like was formulated by a local psychologist and is endorsed by Dr. Deepak Chopra, the mind-body pioneer. It’s called Endorphinate AR and is extremely effective. Stretching, yoga, massage, and chiropractic care are also helpful in easing chronic headaches, especially if tension induced clenching or tooth grinding is the cause. Pick one and use it long term for best results. If your headaches come prior to your menstrual cycles they’re most often caused by low progesterone. Headaches that occur during the week before the onset of a woman’s menstrual cycle are considered hormonal headaches. In most cases they signal the need for more progesterone, the calming hormone that often diminishes during peri-menopause. It’s also the hormone that’s most directly affected by stress since it indirectly helps our bodies produce cortisol, the stress hormone. If you need increasing amounts of cortisol to keep up with your daily life, you’ll actually “steal” from your progesterone reserves to make cortisol. Some signs and symptoms of low progesterone, include menstrual headaches, breast tenderness, ovarian cysts, uterine fibroids, and anxiety and insomnia. These symptoms are usually worse the week before your period. Low Thyroid: Headaches that occur upon awakening and wear off as the day goes on may be from low thyroid function. Further clues that the thyroid is the culprit include poor circulation, sluggishness, hair loss, dry skin and constipation. Low thyroid doesn’t always require medication, but sometimes simply a cleaned-up liver so the hormones you do produce can be more effectively absorbed. Or, you may require more of the thyroid hormone building nutrients such as tyrosine and iodine, that are either depleted by chronic stress (tyrosine) or missing in the diet (iodine). Adrenal fatigue: can also cause headaches. These are usually accompanied by low blood pressure, manifesting as weakness, dizziness and fatigue throughout the day. Feeling dizzy upon standing up and and feeling overwhelmed by life are key signs of poor adrenal function. Concussions: An increasing problem, especially among our kids, are long term headaches caused by concussions. Reducing oxidative stress with high doses of vitamin C and addressing inflammation with Omega 3 fatty acids are both effective way to reduce these headaches (Caution: do not use high dose vitamin C if your child is on Adderal or similar medications). We also find that in both children and adults, hidden food allergies can be a major cause of headaches. You would need to have these evaluated through bloodwork by testing for IgG antibodies. Headaches often clear up when the offending food/foods are eliminated. There are some other more unusual solutions to headaches. One of them involves filtering certain wavelengths of light that may be irritating the brain. Dr. Helen Irlen pioneered the use of specially made glasses to help people remove these irritants, with good success. These can also be helpful for children with ADD/ADHD, ASD and learning disabilities. Another more unusual approach is to wear a pendant or watch with an embedded chip that neutralizes electromagnetic radiation. Don’t just rely on temporary pharmaceutical band-aids to treat your headaches. Find out the true cause and correct it for improved long term health! Be smart and BeWell! Monica Montag, MA, HHP, CN is a board certified nutritionist, certified Holistic Lifestyle Teacher and health detective. She founded BeWell Associates more than 25 years ago and practices in State College, PA.